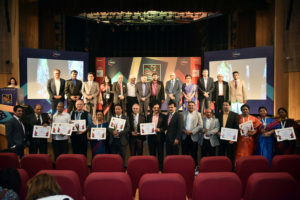 The University has been awarded ‘University of the Year’ (among universities in India in existence for 1-10 years) by the Federation of Indian Chambers of Commerce and Industry (FICCI) at the 14th FICCI Higher Education Summit 2018: A Global Conference & Exhibition held in New Delhi, 30th October 2018. 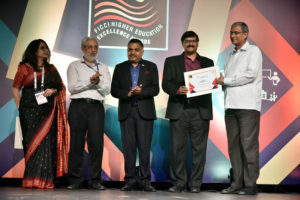 Mr R Subrahmanyam, Secretary-Higher Education, MHRD, Government of India, gave away the 5th FICCI Higher Education Excellence Awards to 13 Educational Institutions and eminent personalities in the field of education. The award recognises the achievements of educational institutions and personalities that have contributed towards the development of the sector in the country. The award was received by the Pro Vice Chancellor, Fr Joseph Nellanatt on behalf of the University. Among the dignitaries present at the summit were Prof. Anil Sahasrabudhe, Chairman, All India Council for Technical Education (AICTE); Mr Pawan Agarwal, CEO, Food Safety and Standards Authority of India and Ms Sobha Mishra Ghosh, Assistant Secretary General, FICCI. 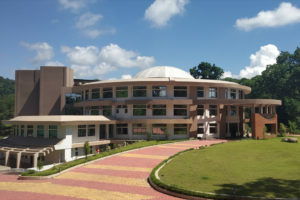 Established in 1927, FICCI is the largest and oldest apex business organisation in India. Its history is closely interwoven with India’s struggle for independence, its industrialization, and its emergence as one of the most rapidly growing global economies. A non-government, not-for-profit organisation, FICCI is the voice of India’s business and industry. From influencing policy to encouraging debate, engaging with policy makers and civil society, FICCI articulates the views and concerns of industry. It serves its members from the Indian private and public corporate sectors and multinational companies, drawing its strength from diverse regional chambers of commerce and industry across states, reaching out to over 2,50,000 companies.